THE YEAR IS WINDING DOWN AND THE TEMPTATION TO STEP BACK WHILE THE LAST 12 MONTHS FADE AWAY IS EVERYWHERE. A general exhaustion from all you did over the last several months is catching up with you. You’ll want to give in. Don’t. At least, not completely. If there’s one thing I’ve found that has helped me at this time of year, it’s to make one plan for myself before the end of December. Taking just a little bit of time to understand what your goals are for next year can be invaluable. It’s January. You’ve just finished a two to three week round of parties, get-togethers, and all-around merriment. Good for you! You’ve earned it. But wait! Now you don’t have any idea what to do next. If it happens to you, you may end up spending the rest of January trying to figure out your next steps. 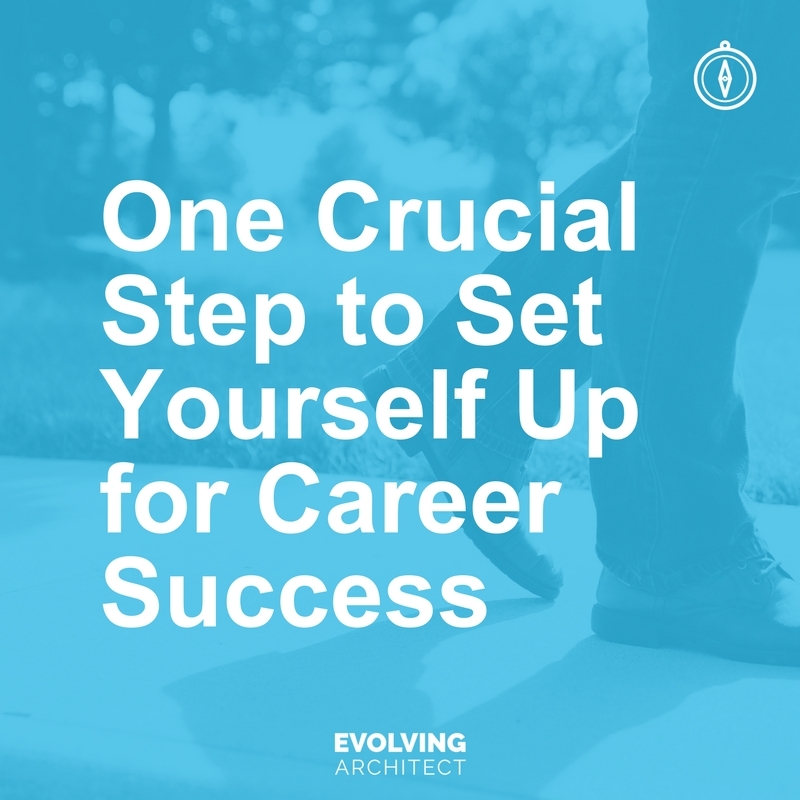 In that time, you could have hit the ground running to set yourself up for major success. Instead, you’ll probably get a bit down on yourself for not thinking ahead. INSTEAD, TAKE THE TIME TODAY TO FIGURE OUT THE ONE GOAL YOU HAVE FOR YOURSELF NEXT YEAR. WE’RE NOT TALKING ABOUT THE GOAL THAT WILL NECESSARILY DEFINE YOUR LIFE. In fact, this goal should follow the following three criteria as you determine what it is: measure, time, relevance. The first criteria is measure. Is your goal something that you can track the progress of? Is there a defined conclusion to it that will let you know once you’ve accomplished it. Let’s say that your goal was to be a better architect in 2017. That’s a really admirable goal. Really, it is. But unfortunately for you, it’s not something that can be objectively measured. While it’s likely that another year of experience would make you a better architect, what do you want to be better at? What skills are you trying to improve specifically? How are your trying to improve them? If you leave your goal too open-ended, you’ll likely be faced with two outcomes. One, you won’t be satisfied that you achieved anything because your goal was too abstract. Two, you won’t progress as fast as you could have if you just set the goal to do something more specific. Let’s say that two friends decide to share each other’s goals for next year with one another. The first friend, John, has the goal to Master Revit so that he could add that as a skill to his resume and possibly look for a new job in 2018. The second friend, Bill, wants to learn more about the profession. Who do you think would be more successful by the end of the year? While it’s certainly possible that Bill will learn a lot because he’s applying himself over the course of 12 months, there’s no clear direction for him to follow. On the other hand, John, can either take a course on or teach himself Revit. He’ll know whether or not the knowledge he’s obtained will meet his goal simply by the way he engaged it. Either way is still better than not trying at all, but wouldn’t you rather know exactly what you’re getting out of your goal? If it’s too open-ended you may determine that you learned nothing important because you lacked the focus to build rather than search. The second criteria is time. Do you have enough time to actually achieve the goal you’re setting for yourself this year? For example, it may take you longer than a year to complete the Architect Registration Exam from scratch. While it’s an admirable goal to have, it may not be realistic. You don’t want to set yourself up for failure by giving yourself a deadline that you can’t possibly, or realistically, achieve. The timeline for your goal should be firm, but fair. It should scare you a bit, but not be impossible. That doesn’t mean you shouldn’t pursue the ARE if that’s your goal. Instead, break it down even farther. Assume, for a moment, that you are starting the Exam from nothing. Since there are 6 sections to the ARE 5.0 now, you could conceivably break the test into one section per quarter. If you were to take a single exam section every season until you completed them, you could potentially be done with it all in a year and a half. That may sound like a long time, but since the average length of testing for an ARE Candidate is at least two years, you’d be ahead of the curve. The final criteria is relevance. Does your goal relate to your career either directly or indirectly? It’s okay to find new hobbies and get involved in new interests, but that’s not what this goal-setting is about. If you want to make forward progress in your career, the goal you make for yourself has to be somehow relevant to the career you’re building for yourself. That doesn’t mean that the goal has to directly apply to your 9-to-5 in the typical ways you’re thinking. For example, your goal could be to get healthier by sleeping at least 7-9 hours every night and losing 40 pounds over the course of the next year. Those goals will combine to indirectly give you more focus and energy. You’ll begin to do other things naturally because you have more energy and become more active overall. You could start eating healthier foods and take it upon yourself to cut out junk food. All of those things add up and will help you be a better creative person. You’ll be able to think even clearer and establish new goals later. Working on your health may be one of the best things you can do for your career. If you’re sluggish and worn out, you’ll start to miss opportunities. You could fall behind in your work, and if unchecked, your poor health could even kill you. Yikes! As I’ve said many times before, the architectural profession is a marathon, not a sprint. Your career is about making small adjustments over time that add up to those big moves. You don’t need to go from recent grad to all-star overnight. One day you’ll wake up and be right where you wanted to go. All it takes is time, patience, and the goals you set for yourself.